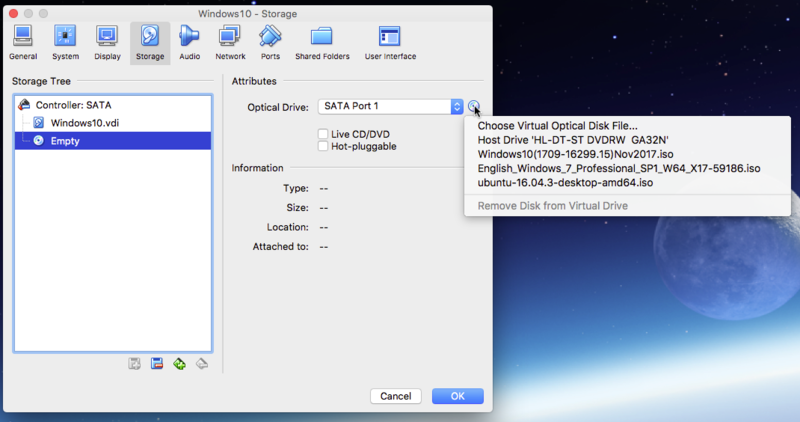 VirtualBox can emulate a DVD (optical) drive. To insert a DVD into an emulated drive, you must first convert the physical DVD to an iso file. You can select this iso file under Settings, as shown below. By the way, if Virtual Box did recognized your external DVD drive, then this external DVD drive could also be selected here. In the image below, my internal DVD drive is listed as Host Drive 'HL-DT-STDVDRW GA32N'. Note: You can click on an image to get a better view. The instructions below were copied from this Apple website. While your Mac is started from OS X (or macOS), insert the Windows installation DVD in an external optical USB drive. Select the USB optical drive so it's highlighted in the Disk Utility window. Choose File > New Image, and then select your Windows DVD from the submenu. After imaging is done, eject your Windows installation disc. Disconnect the external optical drive from the USB port after the disc ejects. Note: Another possibility would be to download the Windows iso from this Microsoft website. Not the answer you're looking for? Browse other questions tagged hard-drive virtualization virtualbox . How to restore Mac OS X on a new hard-drive?